The concept map has many educational benefits. For instance, it allows students studying a specific scientific concept to visualize how that concept relates to other fields and disciplines. It also allows students to group seemingly divergent thoughts as they brainstorm. This individual has stated her position in the central circle: "My position on the war is that I am in between." 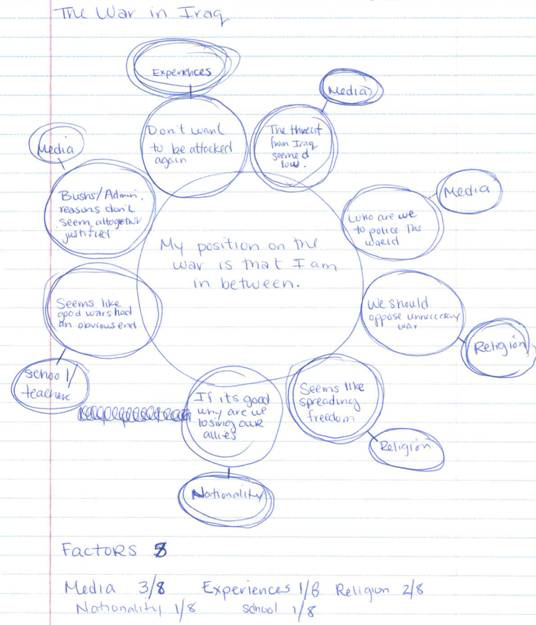 In the next ring of eight circles, she lists reasons for and against the war. Finally, she lists what was the primary influence for that reason (media, religion, etc.). It is that last step that intrigues me. Training young people—and ourselves—to think critically is an essential task for the mature believer. We must know not only what we believe but why we believe it. The pedagogical goal of the church is not merely to convey information. Paul wants Timothy to recall the sources from which he received his convictions. They were trusted teachers and sacred writings. Timothy would do well to listen to their instruction instead of following the hedonistic lifestyles of the false teachers. We also want to equip ourselves and others to think critically about the information we know and how to apply it. Continue to hold fast to what you have known and firmly believed! Pastor Ben Davidson is a great gift to Bethany Community Church. He is constantly thinking of ways to improve existing ministries and help us be more effective in our communication. I'm particularly excited by an idea he's had for awhile but we've just begun to implement this week. Over the next few weeks, Bethany Community Church is testing out this new tool that is designed to help our church apply the truths of God's Word. It's called the "Post-Sunday App" and it is simply a short video where we talk about Sunday's sermon. This excites me because I often hear comments after the sermon or questions at care group and think, "Wow, I wish I could address that issue with the whole church!" 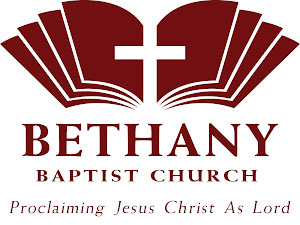 We'll be recording these videos on Monday mornings, so for those who attend BCC, feel free to email any questions you may have had about the sermon on Sunday afternoon or evening. We may address them Monday morning. Also, let us know if you find these helpful. P.S. Several people have asked how many takes this video took. My answer is that it took only one take but we did that one take three times due to technical issues! I’d like to offer several logical options in responding to the election outcome. Each of them have been taken before in American history. The challenge is to find where we are in order to know the proper response. Here are some previous American responses to political defeat. --Revolution Well, now, that’s an incendiary word, isn’t it? But that is what the people did in 1776. Consider the words from our Declaration of Independence: When in the Course of human events, it becomes necessary for one people to dissolve the political bands which have connected them with another, and to assume among the powers of the earth, the separate and equal station to which the Laws of Nature and of Nature's God entitle them, a decent respect to the opinions of mankind requires that they should declare the causes which impel them to the separation. Those who would advocate revolution would say that the abuses and usurpations have grown so great that it is a duty to throw off such government. More likely, however, men are willing, in the present situation, to be disposed to suffer, believing that the evils are sufferable. My own view is that we are not at the point where revolution is even to be contemplated, but we are at the point where we ought to be students of those who went before us on this matter. Departure—The idea of leaving where one is not welcome is as old as the book of Genesis. It is what the Pilgrims did which separated and distinguished them from the Puritans. Rev. John Cotton’s sermon entitled, “The Divine Right to Occupy the Land” is a good example of this view. Go to: http://websupport1.citytech.cuny.edu/faculty/pcatapano/IMM/IMMdocs/cotton_lectures.html A key question that all who advocate departure must answer is, “Where?” Entire life savings were exhausted in the Pilgrim departure. Freedom was loved more than life itself. I’m not sure that one can advocate for departure until a place to land is located. And, as history reminds us, there were displacements of other people groups associated with any group’s arrival. It’s a messy thing. There is biblical merit in such an approach, as Moore wisely points out. However, as a few of the comments to Moore’s article point out, it seems unbiblical to stay silent and “supportive” in the face of pure evil. If one believes that the present administration exhibits evidences of pure evil, it would not be charitable to the larger society to acquiesce. Embrace a different world view—Evangelicals often face the temptation to be trendy or accepted by the culture at large. In the face of serious and dominant cultural disagreements with the clear teaching of the Word of God, large numbers of evangelicals will be tempted to surrender biblical values and embrace the culture’s values. My prediction is that this will be a response embraced by many, many evangelicals in the next two years. As they say, “If you can’t beat ‘em, join ‘em.” This is what happened to Congregationalism in the early 19th century and to the mainline denominations in the early 20th century. Evangelicals seem to be next in line, and some have already crossed that line. Preach the Word—In this response, the church holds up the authority of scripture, engages the culture, politely but relentlessly, and preaches the whole council of God. This will make people angry, not the least of which are some folks within the church. There are times where the preaching of the Word brings societal transformation (see the First Great Awakening or, to a lesser degree, the preaching of Billy Sunday). But there are also times like Jeremiah’s where the preaching of the Word was met with little positive response, much resistance, and great opposition. In any event, there is little fanfare, and most people do not even notice the effect of the Gospel. When the government demands that the preacher’s message be changed, the preacher preaches that message all the more and willingly accepts the persecution that comes as a result. This effort to “preach” is not borne only by the preachers, but by all who call themselves Christians, for the “preaching” is not only what is done in the pulpits but what is done in the neighborhood, in the workplace, and on the recreation field. And true believers are willing to lose their jobs, their homes, their status, and even their lives to make Jesus Christ known. The challenge with this position is to avoid developing one’s own spiritual ghetto. The Essenes of old prided themselves on this position. However, all they did was to create their little world and kept themselves as far from the larger world as they possibly could. A key distinction to avoid that is the importance of prayer and fasting in the fullness of the Holy Spirit. I don't think it is possible to draw near to God in that way and not also be drawn to engage the world. I’d be curious. Which of the above resonate with you? Why? I confess that I find something attractive in all of them. As a preacher, I am drawn to the last position, but the challenging question of how to engage the culture bothers me quite a bit. In future posts, I hope to flesh out a bit more what my approach is and why. The very fact that I am alive in this world means that I must make some further choices on these matters. After today, it will all be over. Or, at the least, this phase of the 2012 election will be over. 4. Four years ago, Mr. Obama made a push for Evangelical votes. 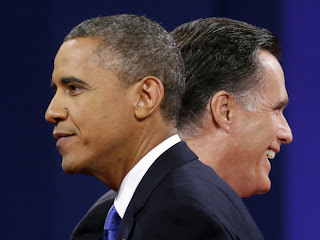 His rhetoric four years ago is in stark contrast to what the Democratic party is proclaiming today about morality and those who hold to a Biblical worldview. He [President Obama] could have reached out to evangelicals, of whatever race, to promote the virtue of chastity. He could have roused the sluggardly mass media from its stupor and forced them to acknowledge how children suffer when they do not grow up with a married mother and father. He could have visited prisons and interviewed the men about the homes where they grew up. He did none of these things. Instead he acted so as to inscribe the sexual revolution in granite, as a new Ten Commandments from on high. In generations to come, this colossal cultural failure, this tremendous opportunity squandered, may loom larger than his economic failure. 5. According to this survey, most pastors have mentioned the need to vote, but not endorsed a particular candidate. That's probably wise. I feel very confident warning us against a candidate, but wary of endorsing the other. I suppose to be totally fair, I am not impressed when the candidate I support enlists some Rock n Roll legend, even actor, to increase my esteem of said candidate. It insults my intelligence. Or, perhaps, it tells me what these candidates feel about the intelligence of the electorate. Although I do take solace today when some artists from the entertainment industry indicate that they, unlike their artistic colleagues, have not drank the Kool-Aid. When I appreciated the Boss the most was during my college days, when I was least informed politically, also dead in my sins and transgressions. As a long-distance runner, I loved the song Born to Run, sang it with all the angst and passion that the Boss sang with, but sensed that he was reflecting anxieties that I wasn’t relating to. But it was a cool tune. I loved the album The River, would sing long parts of it to my bride as we would drive long distances in the car, giving her the permission to sleep as long as she was an audience for me. I have to admit, Boss, I sort of checked out from your music after that point, because you seemed to stray from your pure musical story-telling in order to crank out the more formulaic popular music that took you to mainstream stardom. I liked your real life storytelling best. But Boss, I care deeply about my country. So much so, that I read publications that are far from popular and mainstream to inform my mind about foreign policy and other national and international interests. Sometimes when I run I listen to books on economics, on Islamic history, on social behavior. I have begun to read more widely on the history of our nation’s founding, and the moral, ethical and political concerns that shaped us. Boss, I’m deeply concerned about the fiscal policies and philosophies of any who govern our nation. I’m deeply concerned that we take seriously the mantle that God has granted to us as a nation who would champion the individual freedom of peoples everywhere. More than these concerns Boss, I’m deeply concerned about a government who begins to believe that it has the mandate to restrain religious freedoms of individuals and organizations in order to impose its own policies and agendas, and notably those that sanction murder of the unborn under the guise of women’s rights. Boss, I don’t know if you remember, but in The River, when you got Mary pregnant, you didn’t abort, you did the honorable thing and married her. Boss, why would I possibly believe that you, or others who have made lots of money by entertaining, even entertaining me, have anything to say to me that would sway me to vote according to your own convictions. You may possibly know as much as me in all these important areas, possibly more. Yet I have no reason to suspect you do. And I cannot, nor should I, simply assume that because you have tapped into a vein of common, shared experience with your music, that it logically follows that you know enough to be credible in speaking into the governance of my nation. Boss you tell me that I should hold out for hope and change with the current administration. But I remember you reminding me that ‘everybody has a hungry heart’, and the reality is that they’ve gotten hungrier in many respect due to the last four years. You want me to vote to protect women’s rights and health concerns, but you said it yourself that ‘two hearts are better than one’, so why should we so easily eliminate one of them through abortion? Boss, you sang about that girl who gave up on all her dreams, simply to wait on a welfare check, and yet you seem to advocate an administration whose policies have actually made welfare more extensive and necessary. So Boss, stop insulting my intelligence, and stick to entertaining. I find you more credible in the latter.